Since their victory at the 2011 Copa America, Uruguay have been in something of a downward spiral, scraping into the World Cup with a play-off victory over lowly Jordan. They were never exactly a team best suited to breaking teams down either – primarily functional to give a strong base for a handful of great attackers rather than playing the free-flowing attacking football of some of the other South American teams. Still, a loss to Group D minnows wasn’t on the cards. 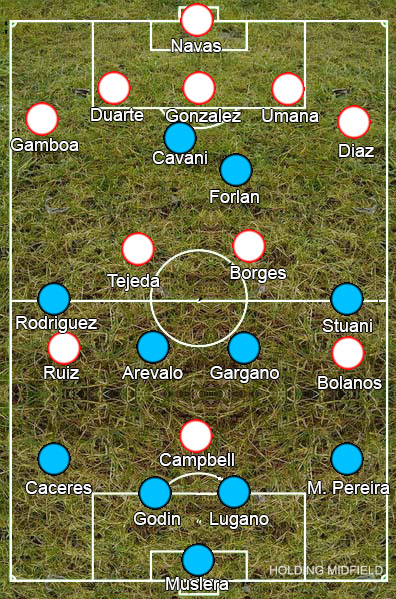 Uruguay went out in a very rigid 4-4-2 with a battling midfield pair of Walter Gargano and Egidio Arevalo Rios and hard-working wingers in Christian Rodriguez and Christian Stuani, while Diego Forlan won back his place in the wake of Luis Suarez’s injury. Costa Rica set up in a defensive 5-4-1 formation, with Bryan Ruiz and Christian Bolanos supporting Arsenal’s Joel Campbell. There was very little to the game until Costa Rica equalised. Uruguay took the lead from a penalty earned via a set-piece – hardly indicative of any gameplan – and no longer needed to break Costa Rica down. All they had done previously was get their wingers forward and look to play balls for Edinson Cavani behind Costa Rica’s relatively high line to little success – crying out for someone like Nicolas Lodeiro to link play. All Costa Rica did in return was hit long balls into the channels for Campbell, RuizÂ and Bolanos to challenge for, with Campbell getting some joy running at the immobile centre back partnership of Diego Lugano and Diego Godin. Costa Rica got back into the game in the second half by allowing right-back Christian Gamboa to get forward, which obviously benefited them when he swung in a cross to the unmarked Campbell to equalise. A goal from a set-piece gave them the lead and then Marcos Urena finished Uruguay off by darting behind their slow defenders to finish a clever through ball. The result throws a spanner in Uruguay’s qualification hopes, but also makes Costa Rica making it out of the group a real possibility, with draws against a mediocre England and traditional slow-starters Italy not out of the question. They most likely won’t, obviously, but they could.